Earlier this week, Titan Salvage and its Italian partner Micoperi presented updated salvage plans for the stricken cruise ship Costa Concordia to the Italian goverment. Titan/Micoperi’s initial plan called for removal of the ship in January 2013, but delays in subcontractor deliveries has pushed the completion date to spring of 2013. Immediately after the wreck on January 13, 2012, all fuel oil was pumped out of the ship’s bunkers and a bidding process initiated for salvage proposals. Titan/Micoperi was awarded the salvage contract and began planning for the removal of the ship from the coast off the Italian island of Giglio. Titan has salvaged some of the world’s most difficult wrecks and has now completed initial environmental and site assessment for the Concordia salvage. 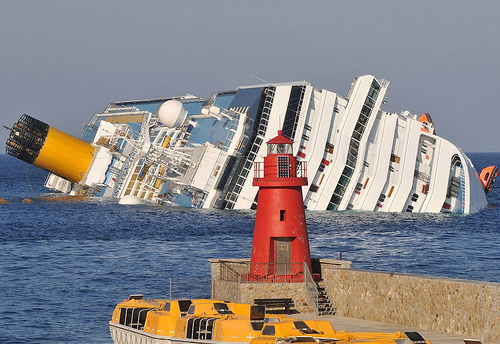 The wreck initially hurt the general tourism industry on Giglio, but “disaster tourism” has spurred an increase in day trippers ferrying to the island to gawk at the wreck.